Mercurius Politicus was a weekly republican periodical edited by Marchmont Needham and first published in 1650. This initiative reflected Needham's second change of allegiance—from 1643 to 1646 he published Mercurius Britannicus attacking prominent Royalists then, having gained a Royal Pardon, he published Mercurius Pragmaticus from 1647 to 1649 in support of Charles I. 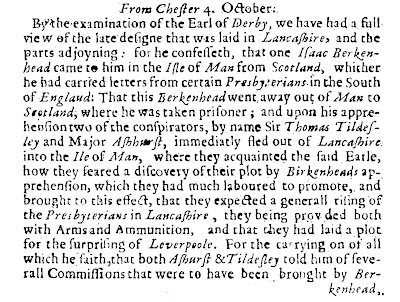 By the examination of the Earl of Derby, we have had a full view of the late defigne that was laid in Lancafhire, and the parts adjoyning: for he confeffeth, that one Ifaac Berkenhead came to him in the Ifle of Man (from Scotland, whither he had carried letters from certain Presbyterians in the South of England: That this Berkenhead went away out of Man to Scotland, where he was taken prifoner; and upon his apprehefion two of the confpirators, by name Sir Thomas Tildefley and Major Afhhurst, immediatly fled out of Lancafhire into the Ile of Man, where they acquainted the faid Earle, how they feared a difcovery of their plot by Birkenheads apprehenfion, which they had much laboured to promote, and brought to this effect, that they expected a generall rifing of the Presbyterians in Lancafhire, they being provided both with Arms and Ammunition, and that they had laid a plot for the furprifing of Leverpoole. 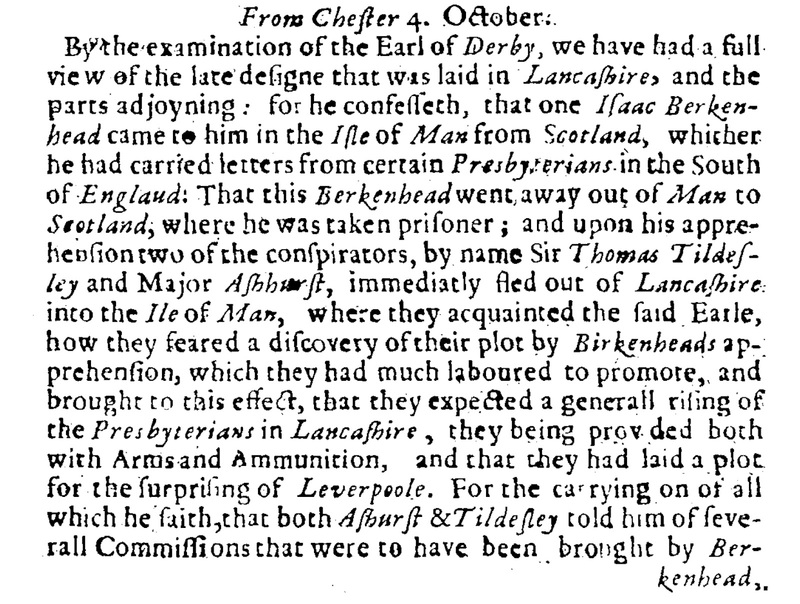 For the carrying on of all which he faith, that both Afhurft & Tildefley told him of feverall Commiffions that were to have been brought by Berkenhead,for fome Gentlemen in Lancfhire; difappointed by his apprehenfion. He cofeffeth alfo, that when himfelf landed lately here in England, both Afhurft and Maffey told him, they had a letter figned by the Scots King, and the Minifters in his Army, directed to the Minifters of Manchefter, which (he faith) their King himfelf alfo told him, was to move them to beftirre themfelves in the Scots behalfe. Which letter both Maffey and Afhurft went towards Manchester to deliver, but were prevented by fome of the Parliaments Fortes being there. He confeffeth farther, that himfelf was defigned to be Generall of the Counties of Lancafter, Chefter, Salop, Worcester, Stafford, and all the North Wales Counties, Sir Tho. Tildefley being intended for his Major Generall, And that he had left his Counteffe in truft with the Ifle of Man, With one Mafter Greenhough to affift her, as Governor.